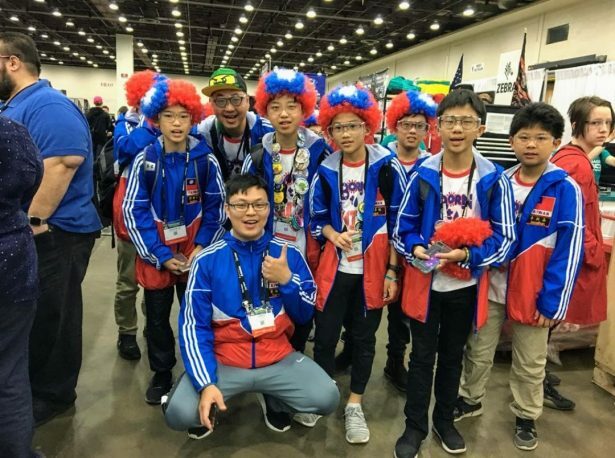 What do the following all have in common: FIRST Robotics teams, apprenticeship programs, STEM (science, technology, engineering, and math) curriculum development, summer engineering camps, after-school engineering workshops, engineering job fairs, manufacturing career field trips, Maker Spaces, Fab Labs, and technology incubators/accelerators? Obviously, this is a list of engineering-related programs, activities, and educational initiatives that help young people realize the possibilities of careers in design, engineering, and manufacturing. 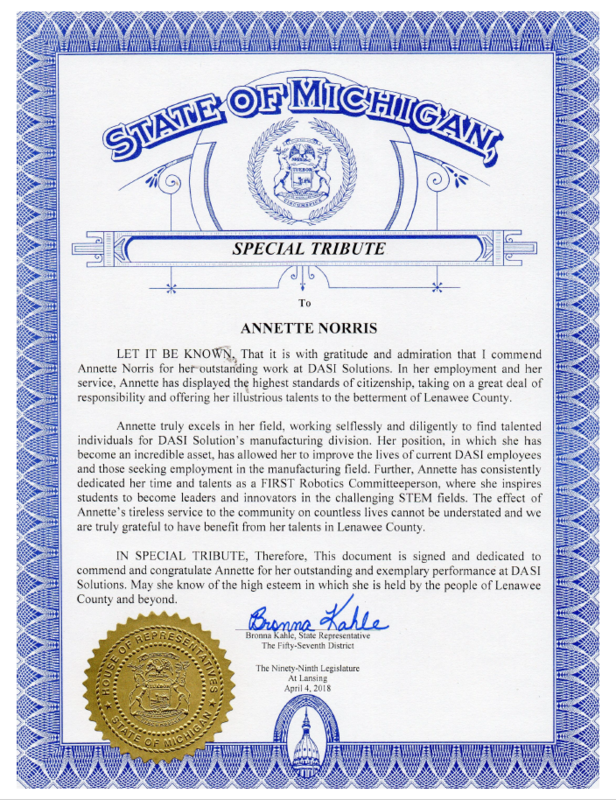 However, this is also a list of the achievements adorning the 30-year-plus career of Annette Norris, who directs the Early Engagement Team at DASI Solutions, the SOLIDWORKS value-added reseller based in Pontiac, Mich.
A graduate of Spring Arbor University with a degree in Human Resources Management, Norris began mentoring young people and connecting them to manufacturing careers as soon as she was out of school. 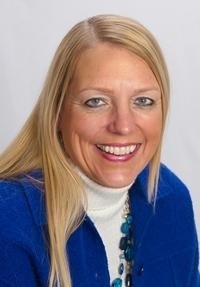 In her first job at the Job Training Institute at Jackson Community College (JCC), Norris worked with manufacturers to conduct assessments of current and potential employees, a role that exposed her to the manufacturing world. The program that Norris directed, the CARE (Concerned Adults Respond Early) Program, identified promising students from disadvantaged socioeconomic backgrounds in the sixth grade who otherwise would have no real opportunity of going to college. Through summer camps, Norris got these students inspired and excited by their potential for attending college and working in manufacturing. Upon graduation from high school, program participants were awarded free tuition for two years to attend JCC. Norris continued to work on educational programs in her next two assignments: first, at the da Vinci Institute, a manufacturing charter school, and then at The Manufacturing Academy, a non-profit organization dedicated to helping people jump-start careers in manufacturing, where she served as Executive Director. In those roles, she served as a liaison between business/industry and local schools, developing field trips, coordinating speakers, and establishing after-school programs and summer workshops for middle school teachers and students. 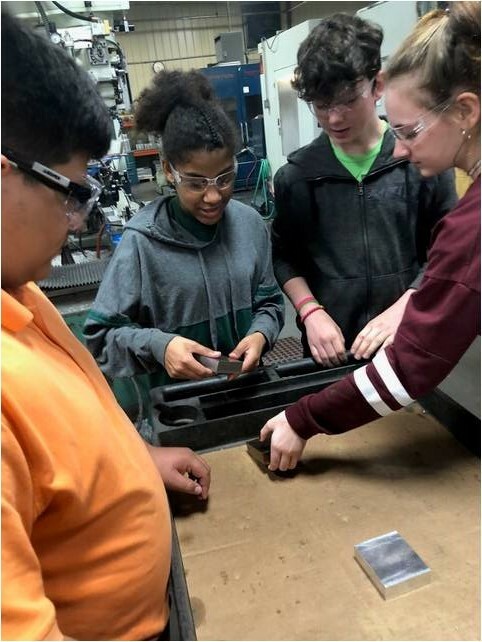 Her experience working with manufacturers helped Norris assist with all aspects of the Jackson County Intermediate School District’s Manufacturing Technologies Laboratory, where she worked as an instructional assistant from 1999-2005. Norris managed the lab, assisted with curriculum development, and worked with teachers and students to organize field trips and speakers in six Career Pathways. It was through this educational experience that Norris realized that providing students with hands-on experience in design and manufacturing techniques was not only fun and rewarding but also changed lives for the better by stimulating student interest in manufacturing careers. So she initiated, organized, and managed the FIRST Lego League Competition in Jackson County. As director of the Academy of Manufacturing Careers from 2005-2013, Norris designed and implemented apprenticeship and customized training programs to meet the needs of South Central Michigan Regional manufacturers, and developed a K-12 STEM curriculum for use at after-school workshops and summer camp programs. Since joining DASI in 2013, Norris has worked in partnership with other local orginizations to secure a $3 million grant from the U.S. Department of Labor to develop and implement an Industrial Design Technician Apprenticeship Program for Michigan companies and has grown DASI’s Early Engagement Team from a single member to a team of five. The team is currently working on expanding the STEM Education, University Research, Maker Spaces, Fab Labs, apprenticeship, and summer camp programs, which the team manages in Michigan and Indiana, into four additional states: Arizona, California, Kansas, and Missouri. “Annette truly excels in her field, working selflessly and diligently to find talented individuals for DASI Solution’s manufacturing division. Her position, in which she has become an incredible asset, has allowed her to improve the lives of … those seeking employment in the manufacturing field. Further, Annette consistently dedicated her time and talents as a FIRST Robotics Committeeperson, where she inspires students to become leaders and innovators in the challenging STEM fields. The effect of Annette’s tireless service to the community on countless lives cannot be understated and we are truly grateful to have benefited from her talents in Lenawee County,” the tribute continues. These accolades bring professional satisfaction for a job well done, but it’s the notes that former students drop her from time to time, thanking her for what she did, that Annette says really make her day.